What perfect timing for my debut post, as I've just downloaded and installed the developer preview (v 0.4.9) of Flock, a new open source web browser based on the Mozilla code base that's been receiving quite some buzz. My impressions of this very cool browser are still developing. I appreciated Axel Hecht's (of Mozilla Europe) more practical take on Flock. There's a lot to be said about Flock, but to keep things relevant to The Digital Story and you photographers out there, I thought I'd focus on their Flickr toolbar that comes bundled with the application. 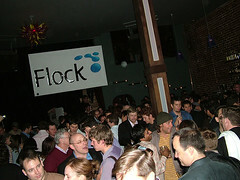 One of the photos from the default photo set offered when you launch the Flckr topbar was from Flock's launch party, which I got to serendipitously attend during Web 2.0. I'm barely visible under the "F" of the Flock sign and a few more pixels to the left. Yes, it bundles with the browser, which is a pretty different approach. Apparently, the folks at Flock are applying the "staff recommendations" concept to web browsing features. So Flock comes integrated with cool services that early adopters have embraced like del.icio.us, Flickr and Technorati. They offer a blogging console (from which I'm composing this post right now) that easily facilitates posting images via Flickr. Dragging a thumbnail from the photo strip in the topbar embeds it into your bog post. Below is an example if what I'm describing. Flock's blogging console and Flickr topbar made composing this entry very straightforward. So Flock is offering something similar to what Derrick is accomplishing with Photon and Ecto, remote blogging integrated with your photo library in a way I find to be quite useful. Still, I wonder how many others will really benefit from these types of features. The majority of web users are certainly not interested in tools for weblogs. I presume that at least some of you readers of The Digital Story would find value you in this.